I'm back in the states and have a whooole lot of catching up to do today. (Bloglines this morning? Ouch). Ireland was wonderful, as you would expect, despite having what I deem a gravely ironic deficiency of wool (at least available for hand knitters). To my surprise (and maybe yours too), I came back empty handed. It's probably better that way after all. In Brooklyn, knitting is back with a fierce vengeance, I'm happy to report. I'm swimming in a sea of stockinette sweaters and decided to start something to satisfy my detail-oriented, cable-happy side. Do you recognize it? This is the humble beginning of my new-and-improved Shedir. I completed my first one more than a year ago and gifted it to my bro for Christmas 2005. Since that was 13 months ago and I'm still thinking about the pattern, I thought it best to start another. I'm not one for repeating patterns, but never say never I guess (especially with a design this clever. And this beautiful). I'm making some significant changes to the original, learning my lessons from the last time - so it isn't an exact copy (the color, however, is. It's the best one in Calmer's palette. And if the shoe fits...) Speaking of this particular yarn, it took a Tubular-Cast On beautifully. P.S. We've got snow on the ground in Brooklyn, and not an unhealthy amount. Finally! Welcome home! I've missed reading you. Can't wait to see the rest of the gorgeous pictures. Welcome back! Just today I was thinking about trying the tubular cast on with Shedir. Thanks for the photo, now I know I will try it. Welcome back. I'm knitting Shedir now for the first time, so I will be very anxious to see what modifications you are making to the pattern. Love the color of Calm you are using. oooh, i'm looking forward to seeing what improvements you're making to shedir.. and more images from ireland. Yarn is indeed lacking in Ireland - there are the odd gems around though if you know where to look. Looking forward to some more pictures. 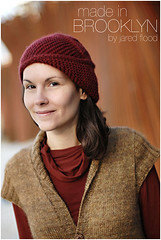 Great looking start on the hat - the color is wonderful! 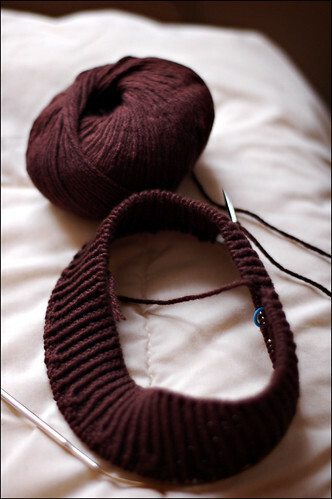 Mmm - coffee cables are the perfect foil for some stockinette. Lovely Dublin photo. But...no yarn?! Gasp. Do they still have pubs? Or has the world really gone mad? I had a freind go to Ireland and I said, well if you see a yarn shop, pick me up some wool - she spent three days looking (said her conference was boring so it was an excuse) and never found any. Bet there are a lot of homespinners and just mills. Interesting though - they have to be there somewhere! Love the yarn for the sweater. The color is amazing. I have being led to that color lately... may have to dye some up. Oh and the pic is great - you have such a good eye. Welcome home again and I hope the jet lag is gone soon. Coming back is always worse...as I am sure you are aware. What a shame you missed our knitting group in Dublin while you were visiting. We'd have let you in on a little gem of a yarn...Kilcarra (from Donegal)...lovely tweedy theme! Available (if you know where to look). What a dream trip! The photo is beautiful. Welcome back! That photo is stunning. I love old rustic facades - good on ya for capturing the colors and nice compositino as well. Welcome back! Thanks for sharing the great photo from Dublin, great shot! that is strange that there is no wool in Ireland!! Welcome back! Welcome back! Where did you go in Ireland? My husband and I got married in near Sligo! Oh I miss Ireland! Beautiful picture and LOVE the Shedir, I liked the 1st one, looking forward to your mods on the 2nd one. It's on my to-do list. Welcome back! I love that shot, amazing colors. Another shedir, hm? I really like mine, but it doesn't stay put! keeps riding up on my hair = conehead. Welcome back! LOVE the Dublin photograph. Beautiful. Enjoy the Shedir! I keep coming back & having a look at the Sherdir pattern! Perhaps its time is near. I look forward to see yours taking shape. I was only reading about the tubular cast on last night. Why did you choose it for this project? Great photo by the way! you gotta love the doors of dublin! Welcome back, I missed all the wonderful photography. And as I was looking at your Shedir, I think that I'll have to make another one after I've finished the one I'm making, but then with smaller yarn and needles. ...and I think I'll have to learn tubular cast-on. Your Dublin photos are all beautiful. Glad to see you back and knitting. I have a ball of Calmer (the salmony color) that should become a Shedir someday. I know what you mean about yarn! My spouse is Irish and we go every year, drag the kids, see the grannies, but I rarely find any gotta-have wool. Its all acrylic and Sirdar. I did visit a friend in Aberdeen and the department store had an excellent selection of Rowan-but we can get that here as well. More fun is talking to the older generation about knitting! Those girls really know their stuff. Hey! Glad you had a great vacation. Ireland must have been amazing this time of year. Boston's still getting an "unhealthy" amount. Slight flurries saturday night and by sunday morning it was in the 50's again. Great start on the Shedir. I've been toying with whether or not to make one. Any yarn suggestions? I actually frogged Shedir (again) last night. This time it wasn't because of messing up the cables, but instead that I want to do one less repeat- I am jealous that you are on your 2nd one! Gorgeous Calmer! My mom had a hard time finding yarn in Ireland (luckily she did find some she liked so I could knit a cardigan for her.) Beautiful photo, too! Welcome back! I read your blog all the time but this is the first time I've left a comment (I tend to be a little shy) I also am making shedir, but I've sent it to the corner for punishment. I'm a little confused, I did row 54 and then 55 didn't go as planned:( So I can't wait to see your new modified one! I showed my mom your blog (she's a very talented knitter) and she couldn't believe how beautiful all you work is! So thanks! Welcome home. Would the colour of the Calmer be Coffee Bean - my favourite! Hmm.. guess I could have warned you about the lack of good wool sources in Ireland (I myslef buy most yarn online). And I'm surprised you did not complain about the weather - Irish winter is so dark, wet and windy ;o) You really should come back here in summer and visit the west coast and see where the Aran sweaters are born. So glad you're back. Your flickr filled a void while you were gone. Enjoy the snow. Here in Thailand there's a paucity of yarn AND snow (and people who no the meaning of "paucity"). I just discovered the tubular cast on (I'm using the Italian one) and LOVE it. Great choice! Love the photo, and glad you're back! Welcome back! Glad to hear you had a nice trip. The photo is very lovely--did you play up the reds? I'm looking forward to seeing your Shedir v.2! Wow, looks like you were missed, to say the least! Beautiful shot - as always, thanks for sharing. Welcome home! Glad you had a good trip and the photo was lovely. I always find a distressing lack of yarn in England . . . nice, in a weird way, to see Ireland isn't any different. Oh, it's on man! I just picked up some #3 DPN's for some DK I've had laying around. I'm oing for a "normal" looking hat this time! Can't wait to see what changes you make. Welcome home. I can't wait to hear about your Shedir modifications. I'm still jealous about your trip to Ireland, but that photo makes me feel like I was almost there. That picture is just wonderful! Glad to have you back! That photo is fantastic. 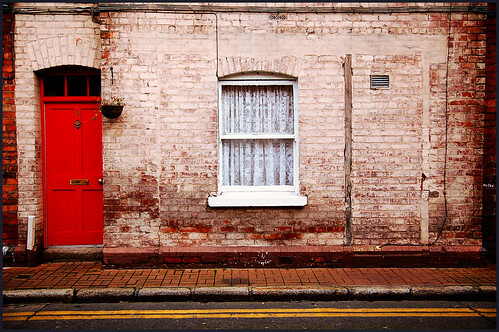 I really like the punch of colour provided by the red door. Welcome back! I love love love that shot ... so beautiful! Gorgeous picture! 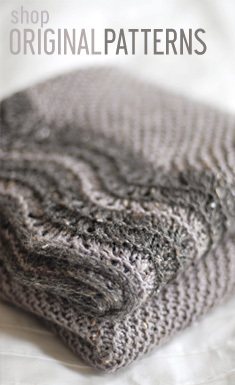 Shedir is such a beautiful pattern, I love the yarn you've chosen. Well, I'm envious like crazy over your Shedir. I so loved the photo of your first that I attempted one myself---and even though I'm no cabling novice I couldn't make the thing come out right. I was wondering if you had any insight to offer because I'd REALLY love to knit one. I've knit three Shedirs so far and think the pattern is just sublime, so I'm really interested in seeing your changes! Am just about to cast on for the fourth (and last for a while), maybe I'll do a tubular. . .
Sure hope your trip to Dublin included a pint (or two) of Guinness! Welcome back! P.S. It's in the 80s and people are out in flip flops and tank tops. Only in SoCal, huh! Better to come back from a foreign country with no yarn in hand? Never!